Seven Days Blogs: 802 Online: It's a boy! My amazing partner Ann-Elise gave birth to our son yesterday! Graham James Resmer — 8 lbs. 2 oz. — arrived at 3:39 yesterday afternoon. Moms and baby are doing fine. Thanks, everybody, for all the well wishes. I will be taking a two-week break from blogging while I'm on maternity leave from Seven Days. Calendar writer Meghan Dewald will be filling in for me starting next week. I promise not to turn this into a baby blog when I return, but I couldn't resist posting this one picture. Isn't he adorable? Mazel Tov, Cathy! A pint of the best British bitter will be drunk in the kid's honor this very evening. Congrats to the both of you and baby too! Thank you for sharing the news as well as the excellent photo. 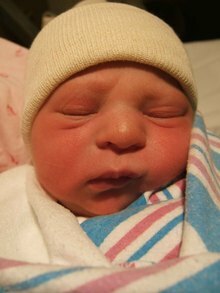 Welcome to the world and the blogosphere Graham. May the future be bright for you and your family. Congratulations on a healthy and beautiful child! It's nice to step back from all the crap in the world and see this. What a gorgeous kid :) Congratulations Cathy! Hi Cathy - Congrats on that gorgeous and very healthy looking baby. Fred and I wish you and your family all the best. Congratulations Cathy and Ann-Elise. Great news, and so cute! Welcome to the planet, Graham. How wonderful! Be happy, Cathy, Ann-Elise and Graham! Wonderful news! It isn't easy- but nothing else is nearly as important or rewarding as raising a child. Congratulations! The begining of a great adventure. Congrats Cathy! Keep us posted on Graham's baby-development progress. Congrats! Welcome to the world Graham! Blesssings on Graham! Welcome to this world, little guy. Congratulations Cathy! Graham looks beautiful. Hey, thanks everybody. We're home from the hospital now and so far so good. Congratulations both of you. You blog, for the time being, has just been demoted to family pet status with the arrival of that beautiful bundle of joy. Prediction: "Blog....meet Vlog..." By the way, did yours come with instructions, neither of mine did...GOOD LUCK! Congratulations. It's a wild ride. Enjoy! He is adorable! Congratulations Cathy and Ann-Elise! ...So when's Graham's blog coming out? Congratulations. And, welcome to the world, little one.